How we function as a society, where we go right, where we go wrong and how it's all a big circus. This book is magic. 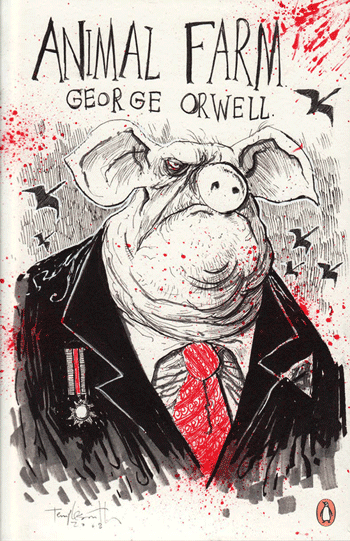 Finally, I picked up George Orwell‘s much talked about Animal Farm. And I am a fan. Not only has he articulated something we see everyday into a very fine analogy, but also told a wonderful story along with it. Countless things must have been written in praise of Animal Farm, but this is my attempt to explain what I liked about the book. The first thing to marvel at is Orwell’s well articulated analogy of animals to show how social structures work and how we behave as farm; the political systems, where they originate and what they end-up being. From dictatorship, to revolution, to a democracy & it’s pain, to communism and back to dictatorship – it comes to a full circle. That’s exactly what happens, over and over again. The narrative blurred the lines between reality and fantasy. There were points where it could’ve become a ridiculous exaggeration; but never did. Only a master of words & thoughts could’ve pulled this off. Especially in times when governments are spying on everyone, citing “You don’t want another 9/11, do you?” (or some version of that); this masterpiece is more relevant than ever. And, I guess, it shall be for ages to come. Absolute abstract rules written in spirit of a revolution and how they change to more practical & biased versions over time and how they translate into reality. Almost every animal represented a certain group of people with those traits – those who work hard & know only that, those who create noise & everything else is lost; and how as masses we have a poor memory. All your political systems, their original intent, philosophy, execution and where they go wrong. In less than 100 pages. This book is magic. Published on January 17, 2014. Updated on January 17, 2014.